This is the fourth instalment of a journey of exploration stimulated by a 1636 Rembrandt etching, Self Portrait with Saskia. Here we further explore the relationship and marriage that led up to the composition. Photograph by David Hill, courtesy of the Fries Museum. 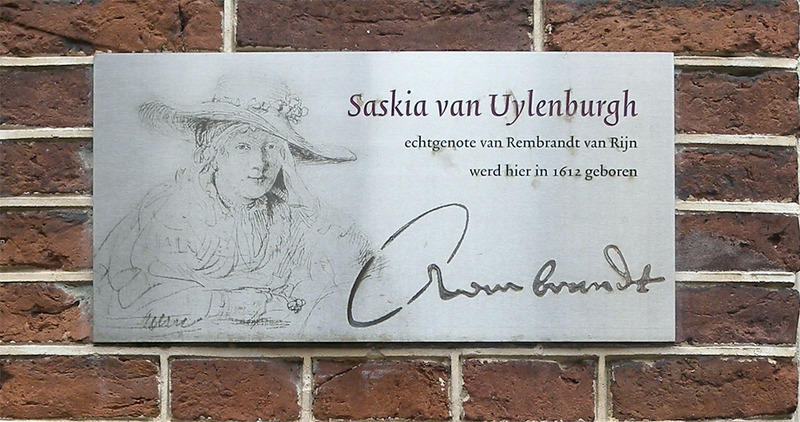 Saskia Uylenburgh was born at 11 Ossekop, in a grand house not far from the centre of Leeuwarden. The house was only recently identified in research leading up to the 400th anniversary of her birth in 2012. It has a modern façade, but parts of the original building have been identified away from the street. 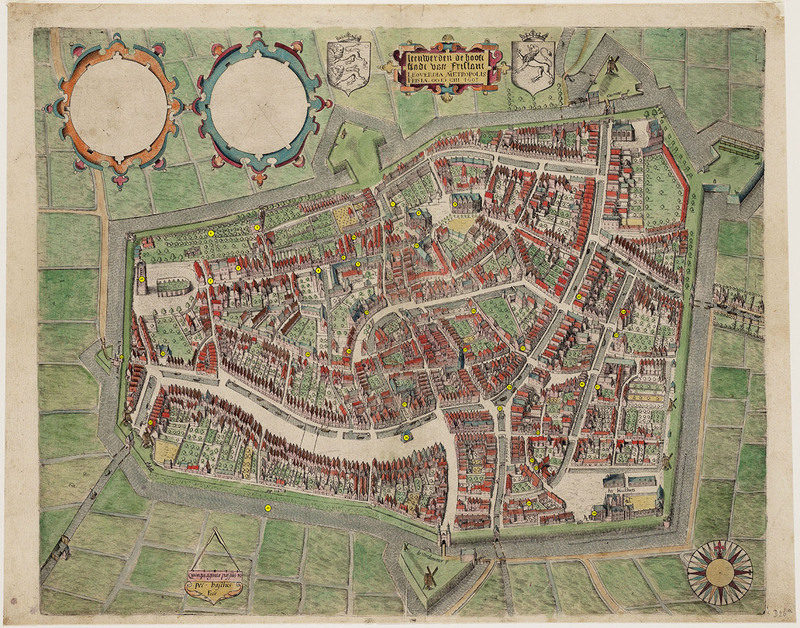 The Fries Museum has a splendid historical map of the city into which Saskia was born. It can be downloaded here. 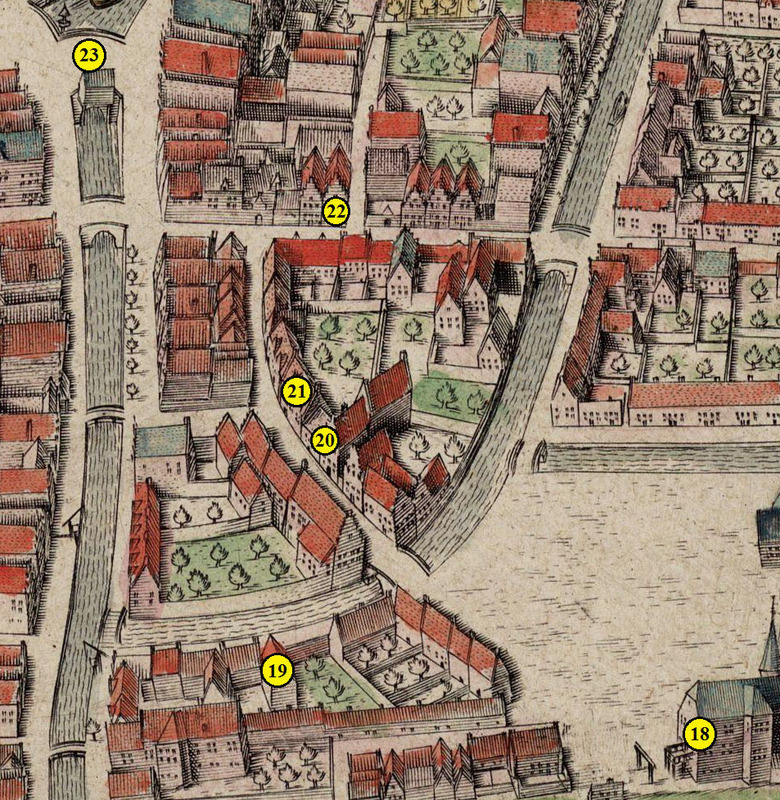 We can find the Uylenburgh house (marked as no.20) in the south-east quarter of the city, situated just beyond the noise and bustle of the market centre. Map best viewed full-size. Click on image to enlarge. The full-sized version of the map can be downloaded here. The house stretches back from the street further than any other in its neighbourhood, and the main part of the building is surrounded on three sides by garden and orchard. It must have been a splendid oasis of calm; or perhaps not, with eight children growing up in it. Saskia was the youngest of eight children. 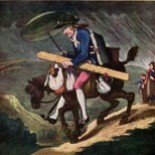 Her father, Rombertus Uylenburgh was one of the town’s leading citizens. As a young man, he studied law at the University of Heidelberg when Europe’s pre-eminent centre of Reformation humanism and culture. He rose to become the first mayor of Leeuwarden, was one of the founders of a University for Friesland at Frankener. 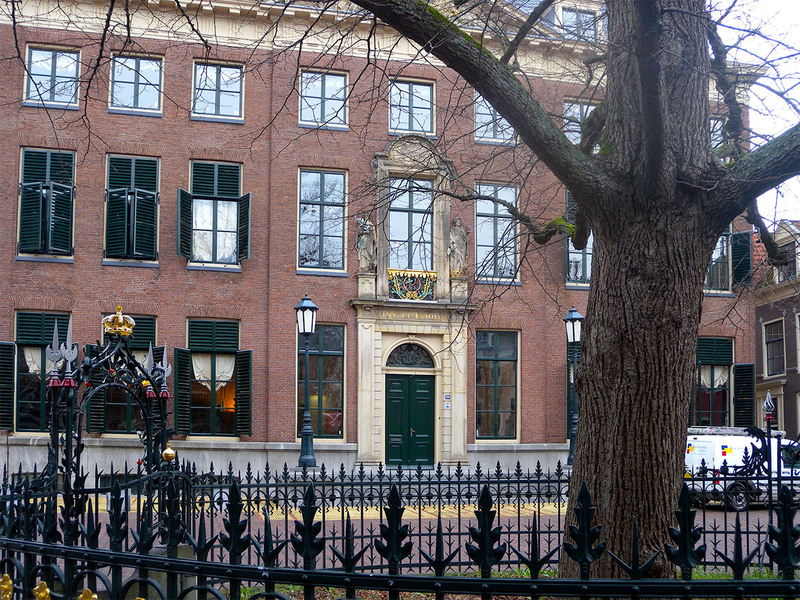 This was only the second university to be founded in the Netherlands and might today have been the Dutch equivalent of Cambridge or Oxford had it not been closed by Napoleon. Rombertus served as mayor over several years, and also as city lawyer, regional lawyer, and finally as counsellor in the Court of Friesland. The Uylenburgh house stood almost equidistant from the council chambers, the weigh house and the prison, and in effect a good part of regional trade, justice and commerce was regulated by Rombertus. He must have been well known to everyone of any consequence in the whole region, and indeed the United Provinces. Rather later than the building that Saskia’s father would have known, but still suggestive of the grandness of his office as Mayor. Saskia had was the youngest of seven children, three brothers and four sisters. All achieved respectable positions, the two eldest boys building successful careers in law and the youngest in the military. The sisters all married well, one to a lawyer, another to Professor of Theology at Franeker University, another to the regional administrator of the north Friesland region of Het Bilt and another to a senior official in the Dutch navy. 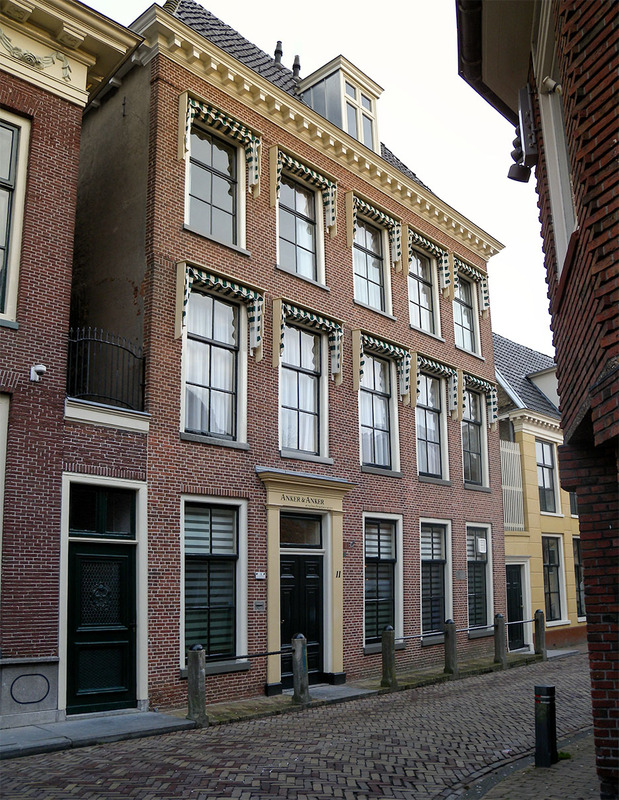 The eldest siblings had left the house in Leeuwarden even before Saskia was born, and the house was progressively quietened by departures to University, marriage and the deaths of her mother in 1619 and her father in 1624. 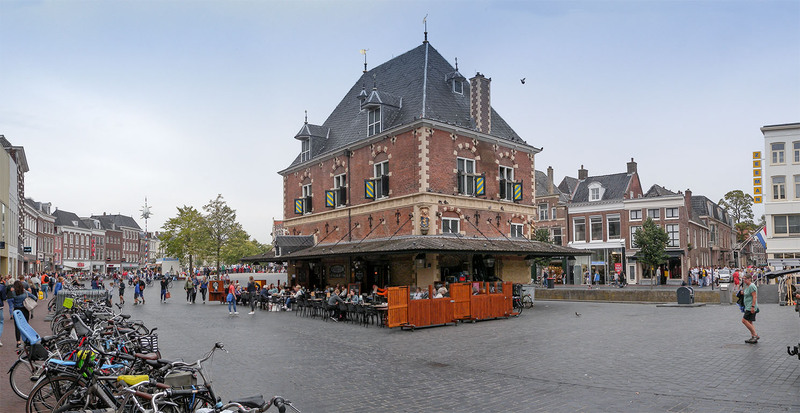 She was sixteen when the house was sold in 1628 and went to live with sister Hiskia and her regional administrator husband in Sint Annaparochie. So Saskia was indeed something special. She had just come to the full flower of her maturity, she enjoyed a solid financial position in her own right and some expectations; she was well educated, literate and cultured, familiar with the workings of the church, trade and of civic law and government. Above all she was respectable, established and rich in family reputation and connections. She was also vulnerable. The youngest child, orphaned since the age of twelve, and ever since dependent on the support and shelter of immediate and extended family. Approaching the age of her majority, it must have seemed high time that she find a respectable position as a wife. Word seems to have gone out to find her a suitable match. I do like the idea of combining holiday jaunts with serious research – and congratulate you on your etching acquisition, and your subsequent investigations. 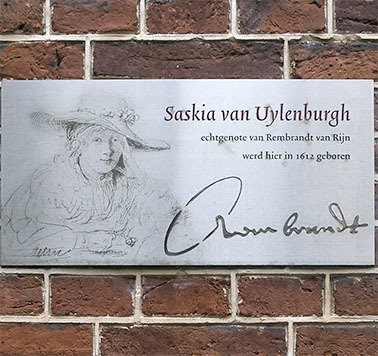 The portrait of Saskia used on the wall plate of the Fries Museum as you know derives from the most exquisite silverpoint drawing (included in the 1992 Rembrandt exhibition, Rembrandt: The Master and his Workshop) – the catalogue entry for the drawing says: ‘The drawn portrait of Saskia has a special place in Rembrandt’s oeuvre. The precision and care with which he portrayed his beloved make the drawing one of his most personal testimonies.’ – it was drawn on 8th June 1633 ‘the third day of our betrothal’ – three days after their legal engagement that is (they were married a year later). I’m sure your next post will elaborate on this and look forward to it. And a day later, serendipitously, my local Oxfam charity shop had on its shelves and now on mine a copy of the NGS / RA ‘Rembrandt’s Women’ catalogue (I didn’t get to see that show – 2001) with an entry for your ‘Self Portrait with Saskia’ etching: which has made me look at it more closely of course. There are some very odd things going on – not least of all the disparity of perspective and scale in Rembrandt’s (superimposed) self portrait – shoulder, arm and hand, and the size of his head….! The only reference work I have is Gary Schwartz’s complete etchings; there’s no commentary or edition details – but at least the illustrations reproduce the etchings at their ‘true size’. 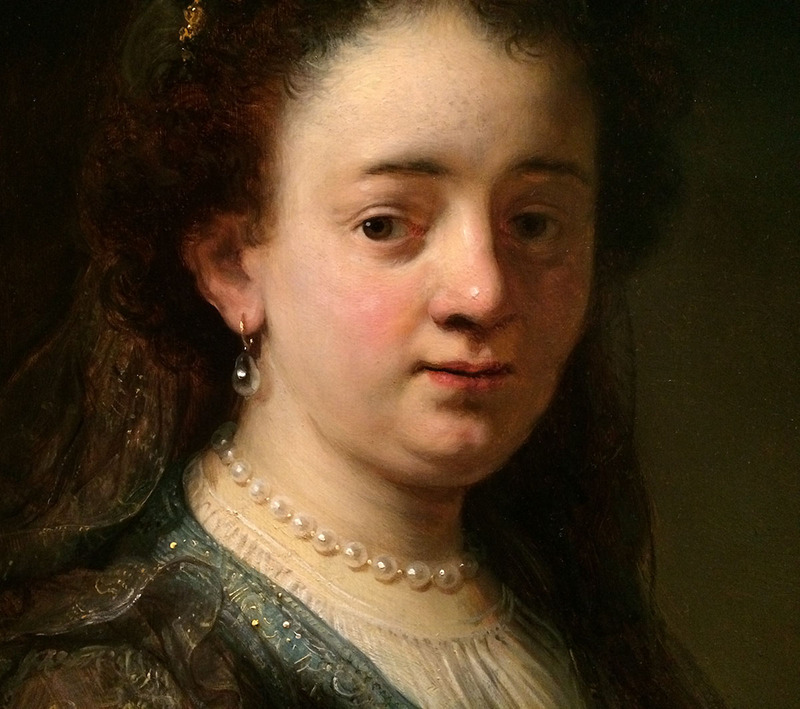 Incidentally, Schwartz does have a rather good blogsite posting mini essays on Dutch art – which you probably know? 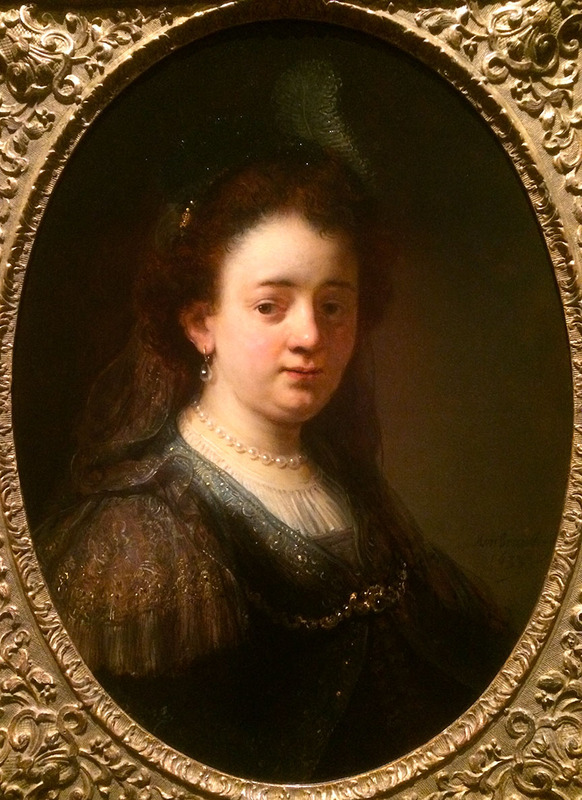 This entry was posted on February 8, 2019 by Professor David Hill in Rembrandt and tagged Etchings, Friesland, Holland, Leeuwarden, Netherlands, Rembrandt, Rembrandt van Rijn, Saskia, Saskia van Uylenbugh.